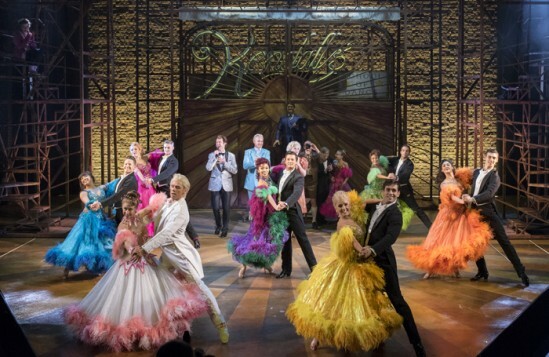 Strictly Ballroom: The Musical at the West Yorkshire Playhouse. Photo: Alistair Muir. Baz Luhrmann’s Strictly Ballroom: the Musical began life in the late 80s as a short play before metamorphosing into a hit film. In the last couple of years, its evolved once again into a musical – and it’s this latest incarnation that director and choreographer Drew McOnie has brought to the stage to entertain Northern audiences this Christmas. A classic David and Goliath-style story, Strictly Ballroom follows a young dancer named Scott Hastings (Sam Lips) and his struggle to find an identity amongst the rigid regulations of Ballroom dancing in 1990s Australia. He battles against bigwig-in-a-wig Barry Fife (Julius D’Silva) and the board of the Australian Dance Federation, while a romance also blossoms between him and junior dancer Fran (Gemma Sutton). On the surface, Strictly Ballroom is quite the feel good hit, and will undoubtedly dazzle and entertain audiences throughout a theatrical season dominated by panto. There’s some true spectacle here; an ensemble of highly talented dancers mesmerise from the start, and showcase some impressive vocal power during a series of energetic, seamless sequences. The ensemble work well together and are confident in their talent and storytelling abilities. I can’t fault McOnie on his overall realisation of Luhrmann’s piece. Soutra Gilmour’s refreshingly uncluttered, well-considered set design helps to hone the audience’s focus on the action, along with Tim Lutkin and Hugh Vanstone’s lighting design, which works harmoniously with the production’s other scenographic elements. Catherine Martin’s costume designs are also nothing short of spectacular and bring to the Playhouse’s Quarry Stage some festive glamour. But dig beneath the surface of McOnie’s production, and indeed take a deeper look at the play itself, and a few niggles find their way to the surface. The main overarching issue here lies in the dramaturgy of the production, or lack thereof. To a degree, it seems as if the respect being paid to the source material weighs down parts of the finished musical. The book itself, adapted by Terry Johnson and written by Luhrmann and Craig Pearce, is filmic in its approach. McOnie taps into this wonderfully, choreographing mesmerising transitions that work in bringing us to new locations while upholding the atmosphere and themes of the production. But some aspects, such as characterisation, falter. Things often feel too internal at times, as if still paying homage to the musical’s origins as a film. They could certainly be pushed more to engage and grapple with the narrative’s new incarnation as a piece of theatre. In spite of these criticisms, however, there can be no doubt that Strictly Ballroom: the Musical is a delightful alternative to other seasonal fare. It’s entertaining, very well put together, and I’m sure as the show continues to run well into the new year, it will gain confidence. The issues lie at the heart of the writing and overall style, and not with this talented, energetic company of performers. Strictly Ballroom: The Musical is on until 21st January 2017 at the West Yorkshire Playhouse. Click here for more details.